In freshman year high school biology, students learn the amazing complexities of the cell. For example, we have been told for years of the cells amazing four letter alphabet that makes up the genome. This alphabet sequences specifies information for building cells. Of course, we know that information always comes from a mind, at least that is our everyday experience (books we read, conversations we have, etc.). Just this level of biologically understanding should point one to a creator. However, this is truly just the tip of the iceberg. Epigenetic mechanisms: Click image for full illustration. What most don’t realize is that the DNA is not the only information carrier in the cell. RNA, a close cousin of DNA and copied from DNA, also caries information. But wait, that is not all, there are little, and not so little, tags on the genes that tell the cell to do certain things. These tags included methyl and acetyl groups among other tags. In fact, these tags are just the small part of an emerging field called epigenetics, layers of information above the DNA. Even the cell structure is now being recognized to hold information. Part of the internal cell scaffolding is now thought to contain parts of this information. More we learn about this information, the more complex cells seem to get to us. Material processes do not create information randomly or systematically. Information needs a mind for causation. As scientists climb the mountian of knowledge, they are met at the top by a band of theologians, who knew this all ready. Designs need a designer. So, what did you think? Feel free to share your thoughts below! 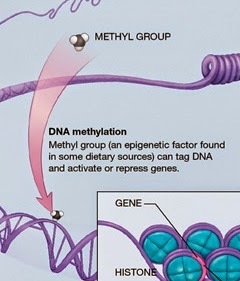 Image source: “Epigenetic mechanisms” by National Institutes of HealthShare With Others!